Posted August 29th, 2018 by Burn Right & filed under News. 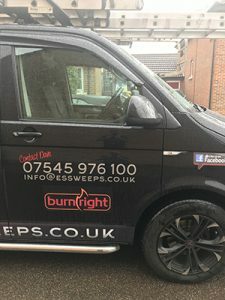 This unique photo of a BurnRight van sticker was spotted by eagle eyed David O’Donnell from Essex. Experts believe it may be an entirely new species and it’s certainly the first one of its kind seen in the UK. The BurnRight team were so impressed, they have invested over £100 in a captive breeding programme run from a secret location in Barnsley. It is hoped that for a very small fee, sweeps from around the country will soon be able to release their very own van sticker in to the wild. BurnRight expert David Sudworth said “We’ve done all we can to give these creatures a real chance, once they are released there’s no telling what will happen”.